Publication assistance services are ideal for writers whose goal is to get published, either for the first time or again. Position yourself for traditional publication or hybrid publication; seek representation by a literary agent; submit your work to magazines and journals; or learn the ins and outs of self-publication so you can DIY with confidence. We research publishers, literary agents, literary journals, magazines, websites, and/or contests appropriate for your work, and tell you exactly how to submit and get noticed. Request a list of ten to fifty targeted opportunities. We develop your existing materials or compose from scratch your book proposals, query letters, synopses, and/or other materials required by agents and publishers, aiming for maximum impact and appeal in order to help you stand out from the competition. Includes all necessary and relevant market research. We submit your queries to your target venues (publishers, literary agents, literary journals, magazines, websites, and/or contests) on your behalf, using a dedicated email address and submissions inbox we set up for you. You’ll have full access, of course, before, during and after submission, so you can be as involved in the process as you want to be. We keep a close watch on your submissions inbox and respond on your behalf to the target venues we’ve queried. We handle all correspondence, from requests for additional materials to coordinating schedules for meetings. We’ll let you know when new responses come in, and celebrate with you when your work is accepted! WBN partners exclusively with Atmosphere Press, an author-friendly publisher that aims to put the power not in the hands of the press, but in the hands of the writer, where it belongs. Founded by WBN coach and consultant Nick Courtright, Atmosphere works with a dedicated team of editors, designers, distributors, and publicists – WriteByNight among them! – to authors see their books reach the heights they deserve. Work with WriteByNight to bypass the slush pile and fast-track your query straight to Atmosphere’s executive editor! 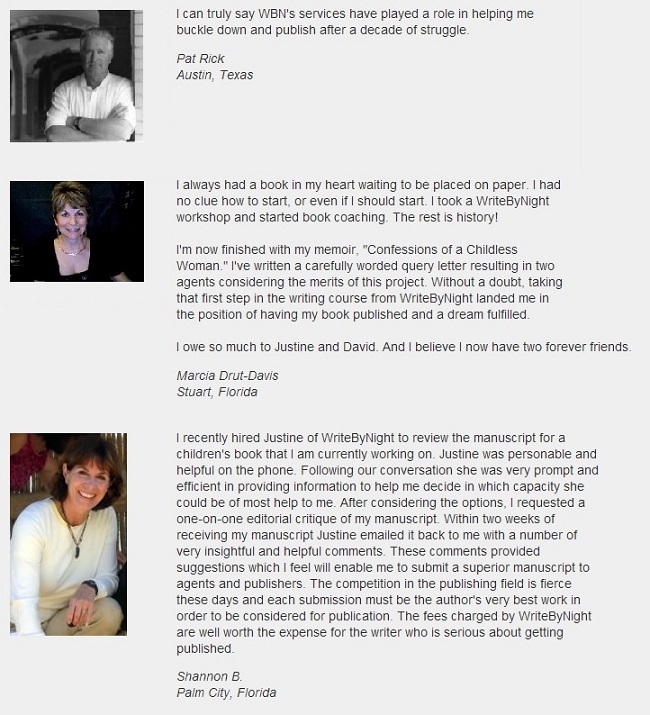 Submit your novel, memoir, nonfiction book, young adult book, children’s book, short story, essay, magazine article, screenplay, stageplay, or poetry for professional review in order to determine which path to publication (traditional, hybrid, and self-publication) is right for you and your work. We’ll read your manuscript carefully and meet with you to discuss our impressions of the work and its prospects for publication, including feedback on areas of craft that warrant attention. You’ll also exchange ideas with your consultant and plan a course of action for proceeding with the project towards publication.